Nigeria National Team and Bayelsa United F.C. 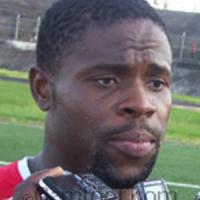 Bassey Akpan is a Nigerian football (soccer) player currently with Bayelsa United F.C. of Nigeria. Abobo', hails from Eket in Eket local government area of Akwa Ibom State of Nigeria. Akpan wears size 7½ or small 8 boot and loves jersey number 18. He has a Nigerian FA Cup bronze medal with the Sunshine Stars F.C. of Akure in 2002. On 3 August 2008 left Bayelsa United F.C. and move on loan to Heartland F.C., in September 2009 turned back to Bayelsa United. In 2002, he played the African U-20 qualifiers; in 2003 was also in the national U-23 team squad that attempted the Olympic qualifiers. Was member of the Nigeria U-20 team by 2001 FIFA U-17 World Championship in the Trinidad and Tobago and played 6 games. He made his full senior debut on March 3, 2010 as a late substitute in the 5-2 win over Congo DR.